With all of this talk about black Confederates it is easy to lose sight of the fact that African American soldiers did indeed exist. Next weekend Harrisburg, Pennsylvania will commemorate the Grand Review of United States Colored Troops that took place in November 1865. Information for the event can be found here. An event focused specifically on black Civil War soldiers reflects just how far our collective memory of the war has come. One would be hard pressed to find anything of this scale in the 1960s during the Civil War Centennial. That said, we should resist the urge to celebrate ourselves too much. I suspect that most people who attend this event will do so with images of Matthew Broderick, Denzel Washington, and Morgan Freeman in the back of their minds. The movie, Glory is an important milestone in our popular understanding of the war and while it introduced Americans to a long neglected aspect of this history it may have pushed even further away the real significance of the sacrifice of these men. To address it would have run the risk of raising the specter of white guilt. In reference to Glory what stands out to me is the emphasis on a progressive story where the individual characters as well as the unit itself becomes more closely connected or identified with the national goal of emancipation and nationalism. Col. Shaw (played by Broderick) volunteers his regiment in the attack on Battery Wagner as a means of impressing upon the nation the sacrifices and bravery displayed by his men. Tripp (played by Washington) begins the movie with an overtly selfish perspective, gradually comes to see the regiment as family, and finally falls in battle while holding the stars and stripes. Even Thomas, who represents the free black men of the regiment and comes to learn during training that he has more in common with fugitive slaves, finds redemption and self-respect by volunteering to carry the flag before the assault on Wagner. The problem is that this completely ignores the history of the regiment through to the end of the war and the challenges that it continued to face. In fact, a broader look at the history of the 54th suggests that it was not at the hands of angry Confederate soldiers that constituted the gravest threat to black Union soldiers, but their own government. It is with this in mind that I reference a wonderful article by Donald Yacovone, titled “The Fifty-Fourth Massachusetts Regiment, The Pay Crisis, and the “Lincoln Despotism”” which is included in the edited collection, Hope & Glory: Essays on the Legacy of the 54th Massachusetts Regiment . It was not until July 1864 that Congress revoked its stance on the issue and awarded the men equal pay from the first day of their service. It is this story that allows us to better appreciate the men who volunteered as non-citizens (Dred Scott) to help preserve this Union, but more importantly it anticiaptes the challenges of Reconstruction and the federal government’s eventual abandonment of these men and the cause of black civil rights. This reminds me of my favorite scene in the movie which precedes the assault at Wagner. Shaw approaches Tripp and asks him to carry the regimental colors in the next engagement. Tripp refuses and a brief conversation ensues regarding the possible consequences of the war. At one point Tripp asks, “What are we going to get”? The movie leaves the viewer with a sense of optimism for the future; on the other hand, Yacovone’s piece better leaves us with the tragic quality of Tripp’s question. I really wish I could attend this event next weekend. It’s important. I just hope that people leave with more than their images of Glory. I think people need to keep in mind three facts when criticizing “Glory”. 1.) The screenplay was written by Hollywood professionals more interested in telling a good story than pure historic truth. 2.) There’s only so much story one can fit into 122 minutes. 3.) The purpose of this movie was to make money, not educate people. I love the movie “Glory”; it’s my favorite Civil War movie. Instead of focusing on some of its errors, I instead praise the movie for getting people interested in not only the Civil War in general, but also African-American participation in it. Hopefully that new interest would then get these individuals out to historic sites where public historians can open up a dialogue about some more complicated issues. Thanks for the comment. I tend to agree with much of what you say, but I disagree that the filmmakers were not trying to educate. Brian Pohanka was involved and appears in the movie and I interviewed a number of reenactors a few years back who took part. They noted more than once that decisions were made with education in mind. Willie, I agree with your comments. The movie has a number of historical mis-statements that enrages some historians. But the big picture is this: before this movie, common memory about colored troops was practically non-existent outside of the academy and civil history buffs. This movie kindled wide-scale interest in the subject. For those who followed-up on the movie by digging more into the history, I think they would be able to see those historical flaws, and thus have a complete and correct view of history. But even for those who only saw the movie and did no further research, I think they’re better off with this flawed understanding than no understanding at all. That is a controversial statement, to be sure. But in this particular case, I feel it’s true. Isn’t there a bit more to the equal pay dating from June 1864? I keep running into service records that indicate free before April 19, 1861. Is there a clause or condition on that equal pay by Congress? I ask because I can not find the language on line (gasp!) but I know there must be something further to it due to the notation on the service records. In fact, I think I ran across one reference where an officer was complaining that a different officer, one in the USCT, was simply listing all his men as free on or before April 19, 1861. I may have read it in one of the many books on USCT I have but my mind draws a blank; and let’s face it I am being lazy. What say you or your readers – was the June 1864 really for all black soldiers or just those free on or before April 19, 1861? Interesting question and I hope someone can answer it. This comment, from the blog at the site for the African American Civil War Memorial, might be of interest. In section 6 of the Militia Act of 1862, which gave President Lincoln the authority to arm men of African descent, Congress mandated that African descent men enlisted under that act be paid only $10.00 regular pay with $3.00 to be taken away for their uniforms. Privates of European descent received $13.50 at that time. When the Bureau of United States Colored Troops was established on May 22, 1863, this section of the Militia Act was interpreted to apply to all men of African descent regardless of rank or whether he was free or enslaved before enlistment. For one year African American enlisted men were denied equal pay, African American commissioned officers received equal pay. On June 15, 1864, President Lincoln signed legislation into law that awarded men of African descent equal pay and arrears. The soldiers who were free men prior of April 1861 were entitled to all of their back pay. Those who were enslaved prior to April 1861 received back pay starting on January 1, 1864. As result of this act of Congress, men of African descent were denied equal pay for only one year, and most received all of their back pay. Therefore, they were not denied equal pay for most of the war, and most who served were not denied equal pay at all. The author of the blog, Hari Jones, is the curator at the African American Civil War Memorial museum. He was a speaker at the event in Pennsylvania, and he touched on the pension issue. The law — http://www.history.umd.edu/Freedmen/equalpay.htm — raised the pay from January 1, 1864 for everyone but for those free at the time of enlistment received back pay from the date of their enlistment. I am on the road but IIRC USCT officers often took the attitude that their men had always been free or had been illegally enslaved so they certified that their men were entitled to the full back pay. Thanks, Mr. Huddleston. I knew it had to be out there somewhere! This is a brilliant post, Kevin. Thanks for writing it. Thanks Sherree. Nice to hear from you. Thanks for your article on the US Colored Troops, mainly, the 54th Mass. It’s a welcomed respite from the discussions about the silly black confederate mythology. Also it’s an even greater relief not to read the questionable endorsements by questionable “pro-black confederate” black people. (Kevin, thanks for your oblique mention in another post about graft). There are a few us (African Americans) who are fans of the Civil War Memory. George Geder, who’s posted here, is one of them. He’s also a descendent of a soldier in the US Colored Troops. Please erase the last sentence of your quote. Take heart in knowing that blacks as well as whites have ignored the history of the US Colored Troops. That’s not to say that there are no historians with an interest in these men. Scholars like Bennie J McRae and William Gladstone have produced and shared with the public a sterling and comprehensive body of work on the legacy of US Colored Troops. I agree that the film “Glory” was a milestone for Americans. However if you said “the Fifty-fourth Massachusetts” and no mention of the film “Glory”, even some film buffs would give a blank stare. My problem with the film is that as a milestone, it has become the only touchstone to the legacy of the US Colored Troops. That’s not the film’s fault. Rather, it’s a lack of interest (black and white) in finding out that the 54th was not the only regiment that fought in South Carolina. Another fast-held belief is that the Colored Troops were from the North. No, Denzel’s regiment didn’t free the slaves at the gates of Tara. The slaves from Georgia, Alabama and Louisiana etc. joined the US Colored Troops. Author Bennie McRae called the 1st South Carolina Volunteers “Freedom Fighters”. I wholeheartedly agree that the Fifty Fourth Massachusetts were courageous men. I was also pleased to read that you discussed their history beyond the movie Glory and touched on Olustee, Florida. Thanks to you and Bob Huddleston for the information about the Militia Act of 1862. Another glaring inequity was with the Veteran’s Pensions. I am familiar with the plight of my ancestor and his fellow US Colored Troops Veterans when they applied for their pensions after the war. Daniel L. Schafer of the University of North Florida created a website that explains why US Colored Troops Veterans were hassled by physicians employed by the Pension Bureau and Southern born Washington Bureaucrats. We need to promote the legacy of the US Colored Troops who fought throughout the regions of the South and the West. Thanks for your contribution. I am a descendant of Charles Trowbridge.I also loved the movie Glory, but facts about the first REAL men that sacrificed would of made it more interesting. I guess the outcome is what made it more Hollywood heroic, instead of first facts.I Dont need glamour in a historical event to make it worthy to read. Thats why they call it NON fiction. Like how were so enlightened to George chopping down a NON existing Cherry Tree. DOH!! I own a book which shows Blacks in the rear rank of reunions of Confederate veterans. When I inquired on this, I was told that it had been the custom (even before the Civil War) for a wealthy Southern “gentleman” to take a household slave with him to serve as a personal servant when he went into the US military. The Blacks (universally looking poor and impoverished) shown in the rear rank of these pictures had been such slaves and were used as cooks, stretcher bearers, etc in the Confederate Army. My source claims they had qualified for Confederate Pensions. (???!!!???) On the Internet, I find few if any items of verification on this, but the photos are many and seem to provide proof. Lest someone take offense at my inquiry, let me describe myself. I am white. I am Jewish. I cannot understand any Confederate Jew as the Passover Service clearly states, “It was not thy forefathers the Lord G-d freed from slavery in Egypt; it was THEE. For had the Lord G-d not freed them, thee would be a slave still.” My father (an ardent Union history buff) taught all his descendants to honor this by serving the US and supporting liberty for all Peoples. All of his sons became historians. I followed Dad’s orders — I am a retired USAF Colonel (30+ years). Please assist me in understanding this issue. Thank you. FYI, the US Army Center of Military History has recently published William Dobak’s “Freedom by the Sword: The U.S. Colored Troops, 1862–1867.” See http://www.history.army.mil/html/books/freedom_by_the_sword/index.html for more information. Dobak retired from the U.S. Army Center of Military History in 2010. He received his Ph.D. in American studies from the University of Kansas in 1995 and is the author of Fort Riley and Its Neighbors: Military Money and Economic Development, 1853-1894 (Norman, Okla., 1998), and (with Thomas D. Phillips) The Black Regulars, 1866-1898 (Norman, Okla., 2001). 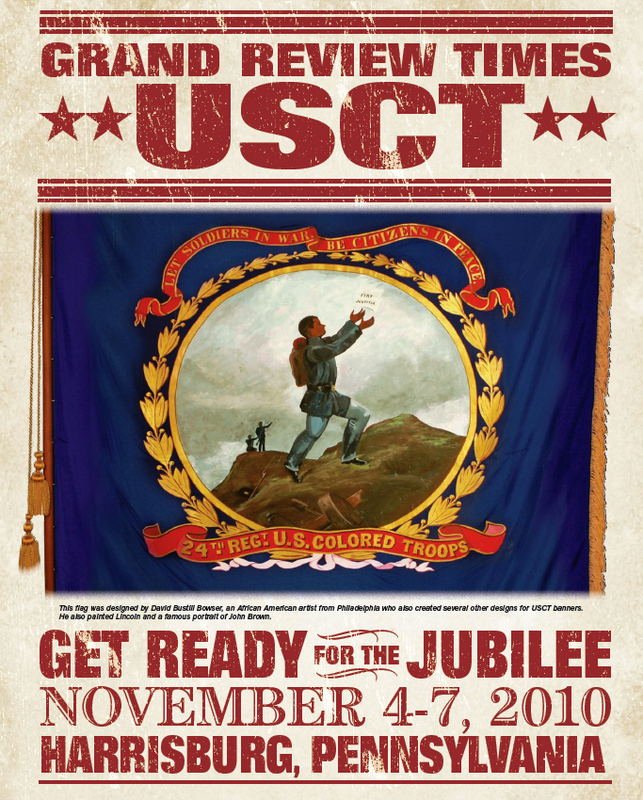 Just wanted to let you know the USCT Grand Review in Harrisburg is being held again this year.